Picoscope 2205 fried "ground bridge"
I accidentally fried a smd component when connecting +12v to channel A ground. There is a component that look fried, and picoscope works fine when shorting this component. 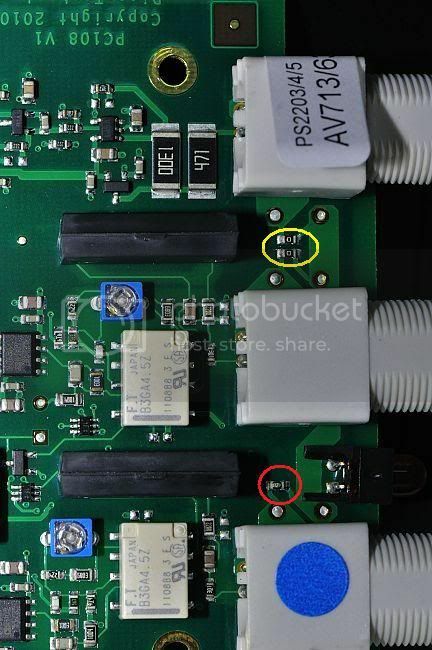 Anyone knows what kind of component and values this is? similar components on channel B measures 0 ohm, making me believe it is some kind of smd fuse? See attached picture, the one in the red circle is fried and the ones in yellow circle is similar! Re: Picoscope 2205 fried "ground bridge"
Please contact us on our Helpdesk (support@picotech.com) with your contact and address details plus the serial number of the device and we can issue you with a returns number to send it in for repair. HansM wrote: Anyone knows what kind of component and values this is? similar components on channel B measures 0 ohm, making me believe it is some kind of smd fuse? See attached picture, the one in the red circle is fried and the ones in yellow circle is similar! It is indeed a 0 Ohm resistor and they are used as bridges. In this case, they seem to be used as fuses too, yes. However, as above - send it for repair though, as I'd expect it'll be tested for any further damage that may not be immediately obvious. TinWhisker wrote: It is indeed a 0 Ohm resistor and they are used as bridges. In this case, they seem to be used as fuses too, yes. Exactly what it is for, just easier to use these than a piece of wire. You can send it in if you want us to look at it or just replace the part yourself.